These curtains are displayed for a week before Easter. The oldest goes back to 17 century. Wow, it's amazing that the church with the simple, plain wooden exterior contains such ornateness and ancient art within! Who would have thought just by looking at it from the outside?? 'Just goes to show we should always dig a little deeper and investigate a little further to understand the real nature of things!! Yes, the article from a link at the top suuggests it is one of the most beautiful church interiors in Poland. There are also detailed photos in the links. The church of St. John the Baptist was built in 1651-1656 thanks to ceaseless efforts and an enormous dedication of the archdeacon and its first vicar Fr. Jan Szczechowicz. The church was built from the top quality knot-free and rot-resistant larch timber (kind of eastern Europe "red-wood") using the horizontal log technique. Initially the church included one narrow nave structure with few small windows and a free-standing wooden bell tower (belfry) in front of it. For unknown reasons it was consecrated only in 1715, almost sixty years years after the construction was finished. 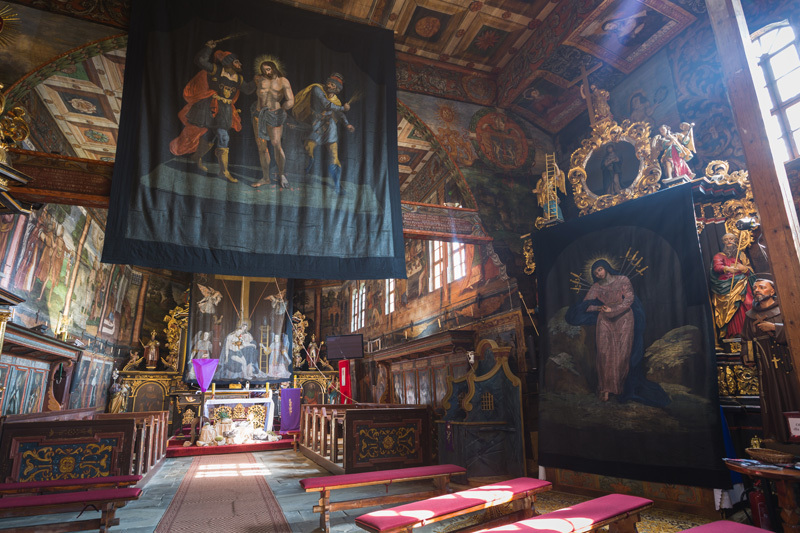 The interior of the church is one of the most beautiful in the area of southern Poland. All walls and ceiling are entirely covered with original polychrome paintings from the 17th and 18th centuries. The most magnificent is a set of 14 paintings dating from 1711 and depicting scenes from the life of St. John the Baptist. The ceiling of the church includes polychrome panels depicting Zacharias’ Annunciation, Nativity of St. John the Baptist and St. John in the forest. The remaining part of the ceiling is richly ornamented with rosettes. The balustrade of the gallery shows themes from the Ten Commandments illustrating various life events common to those days. Interestingly, authors of these biblical scenes used backgrounds and folklore from the Upper Orava instead of those from the Holy Land traditionally portrayed on such occasions. You may recognize on these paintings people wearing mountaineers clothing typical to this part of Europe!